car | CGA in a VGA World. The camry was having problems. At almost 200k miles most people would retire a car but it just seemed too easy. Plus money is tight as hell right now with my wife only working one day a week so once again it was time to put on the man pants and fix stuff. 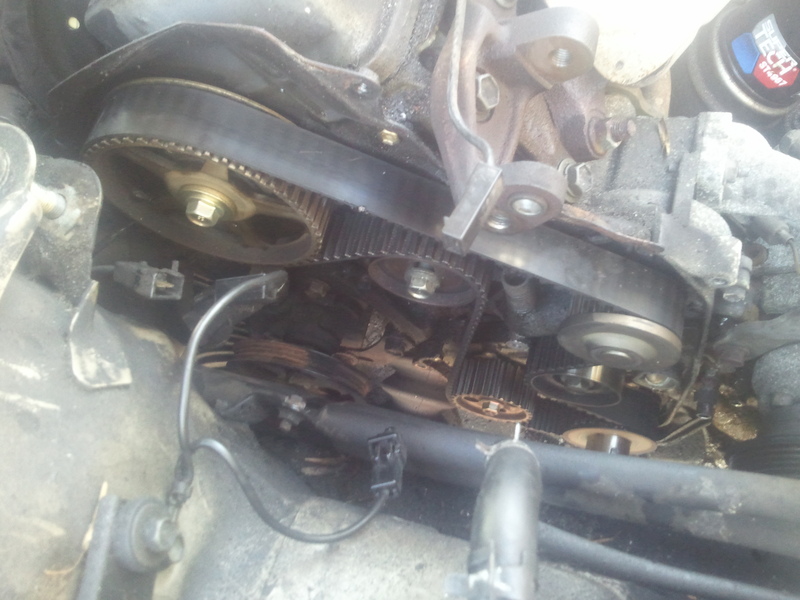 Except that stuff was a timing belt and a water pump which had long since puked out the gasket and bearings. The timing belt itself was driven by a pair of idlers, the new ones sound terrible but the old ones had wobble and had to go. I enlisted the help of my brother to be the second set of hands because there’s some things on the car you simply can’t do on your own. Note that this is the first car I’ve truly wanted to stab. My knuckles are completely raw. I have no hair left on my hands. I managed to crush a fingertip and it’s still bleeding from under the nail. All in all things went pretty well. The biggest lesson learned: Adjust the tension before putting it all back together. We had to retime the engine three times because I would go to close it up and the timing would wander enough to get the timing wrong. Once we figured out we were being stupid it was pretty trivial to find TDC and bolt it up. The real vindication that Obamas bailouts didn’t work comes today with the Chevy Volt getting a pricetag. I’m a car guy, I like American built cars, I even went out of my way to try to buy 4-vin (assembled in America) Toyotas. This kind of crap breaks my evil little heart. Obama “saved” GM, and for that they designed a hybrid who’s main selling point is that it plugs into the wall. Fully twice as much as a Prius. The Volt base edition costs almost $42,000 USD. How much does the base Prius cost? $23,000 USD. It doesn’t even have the cool stuff the high end prius does. No sunroof, no LED lights which will never burn out, no rabbits VS barrels display, no auto tinting windows or solar panel on the roof and spoiler. In short it’s grossly overpriced for what market it’s slotted for. My take is he bailed out mediocrity and our reward is further mediocrity. If Chevy had put out a Caddy for this price, people probably would have bought it, especially since both Chevy and Ford are marketing their luxury brands as being “sporty” and “high tech”. It would have competed well against the Toyota Prius. Sure, Lexus has luxury hybrids, but when you think Prius you think soccer mom. Chevy should have released their hybrid under the Cadillac badging. Not to do so, in my opinion, is a serious miss. What’s the Leaf weigh in at? $32,000 (the tax credit for an “all electric” vehicle actually makes this $25,000 which puts it firmly in Prius turf). This makes it only $5k more expensive than the highest priced Prius, but it’s packed with features which meet or exceed those on the top end Prius making it a decent value for the money. It too has sunroofs, LED lighting, leather, rims, and solar panel options. The range of the Leaf is 100 miles, which is also more than twice that of the Volt. Not having to lug a generator around really helps. There’s been some grousing that this may not be an accurate number but even if it really is half that, 50 miles is still more than most Americans commute to work daily. (I personally would end up 10 miles short). The other grousing is from the Tesla camp saying that the battery packs total lack of active thermal management will cause them to fail, the likelihood of this being an actual issue in my opinion is slim to none. It looks to me like it’s using the frame of the car as a heat sink, and this doesn’t strike me as a bad idea. I think it’s much more likely that Tesla is seeing someone come to market with more than two braincells to rub together and they’re bent that they didn’t think of all this stuff first. My take on the entire situation: GM will die spectacularly by the next Presidency who isn’t going to put up with this horseshit anymore. The Volt is a nonstarter. From their ashes will be born a new GM who will do what GM does best – trucks. Nissan will corner the all electric market unless Ford does something surprising and quickly. Toyota will continue to keep a stranglehold on the hybrid market. The Prius will continue to suffer terribly for reliability on the used market, but this will be overshadowed by the incredibly competitive pricing in the new market. You can pick up a 2006 rebuildable for about $5000. But, knowing how expensive they are even when they’re wrecked, why would you want to? I love Mille Bornes. I was tickled pink when there was a port of it in the BSD-console games package. Problem is there’s a bug where you sometimes need a go card and sometimes do not need a go card. When don’t you need a go card? When you get hit with a hazard like out of gas, and immediately play the remedy (gas), the game will let you play a distance card like nothing happened. Normally this would be a funny oversight, but the computer abuses it too. You know your game is well written when the computer abuses the bugs too.